This infographic map is a collaboration between PolGeoNow and CIGeography, a site focusing on infographics of military operations related to current events. For details on recent changes to territorial control and the political situation in Yemen, see our companion article, War in Yemen: Map of Territorial Control. Map graphic by Louis Martin-Vézian and Evan Centanni (click to enlarge). All rights reserved. This map has also been posted at CIGeography and CIMSEC. Click to see at full size on Taiwan in Perspective blog. 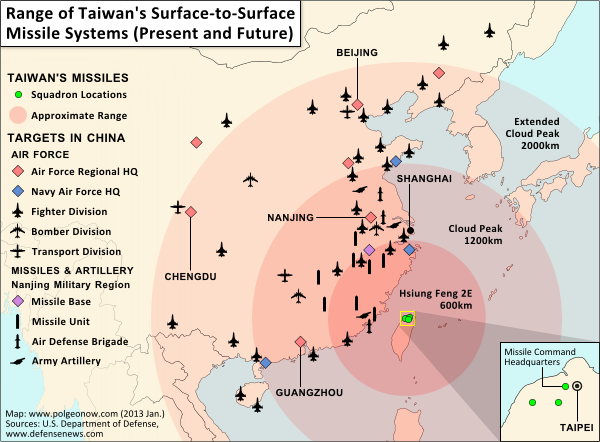 Michal Thim from Taiwan in Perspective recently asked Political Geography Now to help him make a map depicting Taiwan's current and future missile capabilities in its standoff with China. For anyone who's interested, here's the finished product (click on the map to see it at full size on Michal's site). The main sources for the missile information was this article from Defense News, and the locations of China's military assets come from the U.S. Department of Defense's 2012 annual report on China. If you want to learn more about the complex political situation in Taiwan, Wikipedia has a decent outline of the basics. Political Geography Now also hopes to publish maps and articles covering Taiwan in the future.